Massachusetts brewing company, Pretty Things Beer and Ale Project announced they were ceasing operations on Tuesday. Some were shocked, but followers of the brand should not have been. The company was purposely called a "project" instead of "company" because projects are by definition not permanent. As a fan, it was a day I knew could happen at some point, but was saddened that it happened now. Pretty Things was my favorite Massachusetts brewer. Every year I would always grab a bomber of Fluffy White Rabbits, Our Finest Regards, American Darling, and the rest of their beers as they were released. I also loved their Once Upon a Time series of historical brews they made in collaboration with brewing historian Robert Pattinson. After hearing the news I stopped in at Bogie's in Beverly to pick up some of their beer. A year or so ago the owners of Pretty Things Dann and Martha Paquette hosted a tasting of Pretty Things on a Thursday night. They then stuck around for Bogie's regular Thursday tasting with Bogie's patrons, and bought some beer to take home. Unfortunately, I wasn't there, but everyone who was had noting but great things to say about Dann and Martha. I've seen similar stories online in the past couple days. That will make their absence in the local craft beer scene felt even more. I was thinking about why I loved their beer so much. I think my brewing on a much smaller and inferior scale is not dissimilar their approach. We both brew the beer we want to make and to drink. Like myself, Pretty Things brewed a wide array of styles. Their beers were unconventional, while still being traditional. Instead of throwing in weird and exotic ingredients into their beers just for the sake of being weird and exotic, they would push boundaries by doing things complicated multi-step decoction mashes and combining traditional ingredients in nontraditional ways. Their flagship Jack D'or saison is a traditional saison with American hops. Saint Botolph's Town a brown ale, uses both a German and British yeast, while Fluffy White Rabbits uses English malt in a tripel. As a brewer, beer drinker, and nerd, I love when a beer or a brand can teach as well as entertain. Enjoying Pretty Things' beer did all of that. They also demonstrated that you can brew traditional beers that are truly excellent. I can only hope the eclectic, mostly traditional beers that I brew will compare to theirs. Dann has been involved in craft beer for over twenty years. Hopefully him and Martha will come out with a new project of some kind at some point in the future. Last year I brewed two versions of this beer: a ten gallon all-grain batch at Andy's, and a simplified malt extract version for Learn to Homebrew Day. When I tasted the beers side-by-side, the all-grain version was better, if a bit lighter in alcohol than the extract version. The recipe was a slightly modified version of a Charlie Papazian recipe from The Complete Joy of Homebrewing. I imagined the beer as a bigger and hoppier version of his recipe. Seeing how alcoholic the extract version tasted, and how crisper the all-grain version was, inspired me to scale back the recipe a bit for this year. The all-grain was supposed to be similar in alcohol to the malt extract version. Improving our efficiency, the amount of fermentable sugars we extract from the grain, and maintaining a consistent level of efficiency on Andy's system has been a challenge. As it was, our all-grain beer not finishing as heavy as intended was probably fortuitous. Last year we had a lot of Pa's Lager left over after our family Christmas get-together. I think it took us until March to kick both of the five gallon kegs. Both of Andy's kegs are full at the moment. For this year my plan is to brew a three gallon batch and keg it in one of my three gallon kegs like Fort Dummer and Shareholder's Saison. This is also an excuse to show up with my awesome new jockey box. Under the old 2008 BJCP Guidelines the beer was a cross between a Premium American Lager and a German Pilsner. One of the new styles added to the new 2015 guidelines is International Pale Lager. A highly-attenuated pale lager without strong flavors, typically well-balanced and highly carbonated. Served cold, it is refreshing and thirst-quenching. When scaling the recipe I set my target starting gravity and bitterness at the absolute top end of the style parameters. "Highly attenuated" means the beer should finish dry. The California Lager yeast will give the beer the crispness of a lager, but it's attenuation is low. I am going to mash as low and as long as I can, to produce a highly fermentable wort that will make the beer attenuate as much as possible. With any luck the beer should finish around 5% alcohol by volume. One change I made was adding a couple of drops of Lactic Acid to the mash to lower the pH of the mash. A couple of members of the North Shore Brewers emphasized the importance of pH in the flavor of the beer. I have a pH meter and have been logging my pH, but I haven't been doing much to adjust it. On their suggestion I picked up a bottle of Lactic Acid to take more control. Most of my beers to this point have been in the acceptable 5.2-5.5 range, but on this brew day I was able to get my pH right to 5.2. In light beers like this the pH can creep up without the acidity that comes from darker malts. Brew day went fairly smoothly. I was able to hold my mash temperature, and had a rolling boil on my stove-top. I siphoned my wort from the kettle into a five gallon carboy, and topped off with a gallon of distilled water. I wasn't able to take an accurate measurement of my volume, or starting gravity. I'll measure both at packaging time. Going forward I need to do a better job of measuring these when I brew three gallon batches. Even though I brewed the beer at home, I took my carboy to Andy's to ferment in his cool, unheated basement. The temperature there is right in the appropriate range for the California Lager yeast. Even with my thermostat set at 65F, it can still get up to or over 70F in my apartment on a sunny day. The jostling around in transit will help aerate the wort. Pa Chalifour dabbled in homebrewing. I wish I had a chance to talk to him about it. He was a man who every time you saw him was involved in a new hobby, interest, or scheme. None of his schemes made him rich, but he was rich in family. We will remember him by drinking a beer he would have loved. When I started brewing I thought the first beer I made was world class. It blew my mind I could make something that good at home. Over time I became increasingly critical of my beer, but every once in awhile I brew something that brings back that old feeling from my early batches. When the cap is popped the beer makes a very light hiss hinting at the low carbonation in the bottle. Midlands Mild pours espresso brown with a ruby hue. The off-white head is thin and frothy. I poured the beer mostly in the middle of the glass to help the head rouse. The retention isn't great which is to be expected in a lightly carbonated beer. A mild is a perfect canvas for English yeasts that produce fruity and floral esters, and this example is no exception. Notes of honey and melon are prominent in the aroma. There are also faint notes of cocoa lying in the background. The low carbonation and high percentage of specialty malts give the beer a medium body with a creamy mouthfeel. The beer starts sweet, but the finish is sufficiently balanced with hop bitterness and roasted malt flavor. There is some cocoa powder and licorice in the finish, but nothing that by any means dominates a 3.5% alcohol by volume beer. This beer is everything I wanted it to be. As a brewer formulating a recipe you start with an idea of how you want your beer to look, feel, and taste. When I brew something that finishes exactly how I intended it brings me back to when I first started brewing. I shared this beer at a recent North Shore Brewers meeting. The meeting was to discuss cask ales. I brought Midlands Mild because its low carbonation is intended to replicate a cask ale in a bottle. The response was very positive at the meeting. I also threw in a bottle with some beer mail I sent to fan of the blog Todd S. in Minnesota. He gave the beer a more than respectable 3.75 on Untappd. This is one of my favorite beers I have brewed. It is a beer that works in any season or occasion. There is nothing about the beer I would change. I developed the recipe and ordered the ingredients several months before I made time to brew the beer. When I revisited the recipe on brew day it looked overly complicated. I couldn't figure out exactly what I was trying to accomplish with my ingredients and almost changed the recipe on they fly. Thankfully I did not. I have hit on a new house recipe. Whenever I brew a mild it will be this recipe. The first year Andy and I brewed Pa's Video Board lager, our family kicked the five gallon keg in a few hours. Last year we brewed a ten gallon batch to make sure we had enough. As it turned out our family Christmas gathering was on a Sunday and people didn't have the same beer-drinking vigor knowing they had to work on Monday. We had a ton of leftover beer. By the time all that Pa Lager was gone I think we were all bored of it. This year I brewed a three gallon batch in honor of Pa Chalifour, but I also decided I wanted to brew another beer the family could enjoy during the holidays. My thought was to brew a West Coast IPA for my hop-loving cousins. As a beer drinker seasonal creep drives me nuts. I loathe it to the point that I developed the definitive guide for seasonal beer. Usually seasonal creep is an annoyance. I can still wait to buy a beer like Samuel Adams Octoberfest at the seasonably appropriate time. However, when a seasonal beer is an IPA that is best enjoyed fresh is when seasonal creep becomes problematic. The hop flavor and aroma in will diminish as it sits on the shelf. 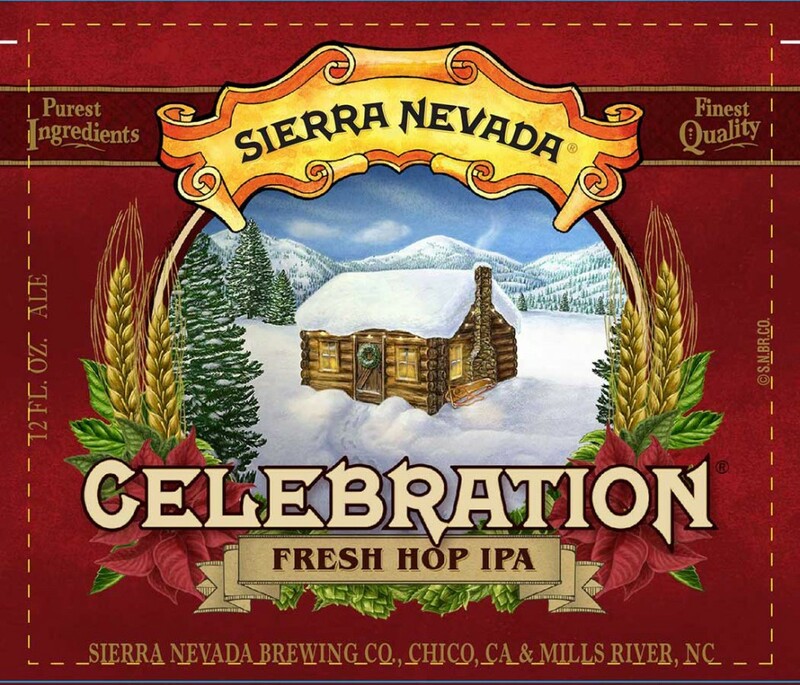 Sierra Nevada Celebration Ale is a classic West Coast IPA. In that sense it is a beer that can be enjoyed rear-round as opposed to drinking a 10% alcohol-by-volume imperial stout during our recent 75 degree weather. Maybe it's the snow covered cabin on the label, but it is a beer I want to enjoy, and enjoy fresh, during the holidays. Brew Your Own magazine published a clone recipe back in 2004. A brewer named Chris Dibble loaded a version of the recipe into his BeerSmith cloud account. I downloaded Chris' version to my account, scaled it on my iPad to a 3 gallon batch, tweaked the recipe to use some ingredients I already had and to match specifications listed on the Sierra Nevada website. It is entirely possible they Sierra Nevada has made changes to the beer since 2004, and that the website's information is more current. I would have thought the recipe would have called for more hops late in the boil and more dry hops. I did tweak the recipe with a small addition of Cascade and Centennial hops near the end of the boil. This is what Sierra Nevada's website seems to indicate. Celebration isn't a new-school, juicy, East Coast hop bomb. A West Coast IPA should be more bitter. I am interested to see how the hop flavor compares to my recent nouveau East Coast ales. Sierra Nevada put the "Chico" yeast strain on the map. It is the house strain at too many craft brewers to list. Many home brewers use it exclusively. I prefer using different strains to make my beers different. I haven't used Chico in so long I dumped my jar of WLP001 from my yeast bank because it was so old. I have to use Sierra Nevada's yeast in a Sierra Nevada clone. I went the cheap and easy route by picking up a packet of Safale S05 dry yeast. Needed a little extra water to hit my target volume. I still boiled off more of my wort than expected. The green duct tape on my carboy are gallon markers, I was about half a gallon short. I topped off with more distilled water to hit my target volume of 3.15 gallons. This will be the second brew I have on draught for the holidays. I can't wait to do a side-by-side of my clone and the original.